Implications of Wentworth: Can Progressive Liberalism Triumph Across Australia? As the days pass since the Wentworth by-election, a new level of resistance has emerged in the federal LNP on the best responses to the arrival of Dr Kerryn Phelps in Canberra. The blind-spots are evident in both the progressive and conservative wings of the LNP. The federal LNP’s electoral successes in holding electoral jewels like Wentworth are the product of over seventy years of largely successful campaigning. As the Cold War intensified, the LNP mastered a shrill conservative populism which predated the excesses of Margaret Thatcher and Richard Nixon. The LNP had become an entrenched conservative party. It is stubbornly resistant to change despite the 18.8 per cent swing against the Coalition in Wentworth. Commitment to market ideology and the US global military alliance are the cornerstones of Australian LNP politics as in the late 1940s. In the closely contested national elections of 1954, Deputy Leader of the Parliamentary Liberal Party Sir Eric Harrison was not opposed in Wentworth. Sir Eric Harrison (1892-1974) represented Wentworth from 1931 to 1956. He was appointed High Commissioner in London (1956-64). The by-election to replace Sir Eric Harrison on 8 December 1956 contained some of the elements of last weekend’s by-election. It produced an even stronger swing against the LNP. Local leadership transitions for a long-standing representative can be sticky affairs for both sides of politics as shown by aberrant swings in Bass (1975), Oxley (1988), Wills (1992), Canberra (1995) and Ryan (2001). Josh Frydenberg has played down the need for a significant shift in the Morrison government’s stance on climate change before the next federal election after the strong protest vote in the seat of Wentworth. The treasurer and former energy and environment minister Josh Frydenberg told Sky News on Sunday people in Sydney’s eastern suburbs were concerned about climate change, but he said the government did not intend to “reduce emissions at the expense of people’s power bills. Scott Morrison has shot down an overture by Labor aimed at breaking the political deadlock over Nauru, declaring “you don’t horse-trade on border protection”. Labor on Tuesday proposed three amendments to government legislation designed to close off re-entry to Australia for any asylum seekers resettled in New Zealand – legislation the opposition has previously rejected outright, and the shift was welcomed by several Senate crossbenchers. Other high-profile figures, including the former human rights commissioner Gillian Triggs, have backed the bill as a pragmatic solution to get children and families off Nauru, and lower house crossbenchers have urged the Coalition and Labor to come to an agreement. Initial signals during the Wentworth by-election campaign did suggest that Scott Morrison was charting a new policy direction for the LNP government. Scott Morrison offered bipartisan support to protect gender diversity in private schools and the passing on of reduced company tax to medium sized businesses. The second last week of the Wentworth campaign brought a retreat to old time LNP values. With an unguarded impromptu comment at a beach-side interview, Dave Sharma gave support to move the Australian embassy to Jerusalem. Prime Minister Morrison supported the casual aside. As the former Australian ambassador in Tel Aviv, Dave Sharma should have been aware of the negative consequences of this diversionary issue which would have divided Jewish opinion in Wentworth. Dave Sharma’s connections to Israel extended far beyond his appointment as Australian Ambassador to Israel (2013-17) as part of an impressive career path within DFAT since 1999. Some of the strategy confusions in the federal LNP extend to some of its other electoral jewels in metropolitan electorates. Malcolm Turnbull has admitted he went into bat for Jane Prentice at her recent preselection – urging her branch in Queensland to keep her as its representative – and was ignored. The prime minister, who referred to the assistant social services minister as “a friend of mine”, said he believed he had done all he could to boost her chances of preselection for the seat of Ryan, but would not be intervening to insist she was reinstated. Letting go with the past is difficult for LNP strategists as it means abandoning the fear strategies about fragility of market ideology and security threats to Australia which have been used so successfully since the 1940s. In today’s circumstances, giving more autonomy to the National Party to work co-operatively with far-right parties in regional electorates, could perhaps co-exist with a more progressive interpretation of liberalism in comfortable metropolitan electorates like Wentworth. Independent cross-bencher, Cathy McGowan has ruled out supporting this possibility through the return of Barnaby Joyce as National Party leader (AFR 22 October 2018). Meanwhile back in Wentworth, there was no outbreak of class politics against unaffordable housing prices and falling real wages at the Wentworth by-election. The property market in Bondi Junction is going through a correction but housing affordability is still geared to the big end of town. 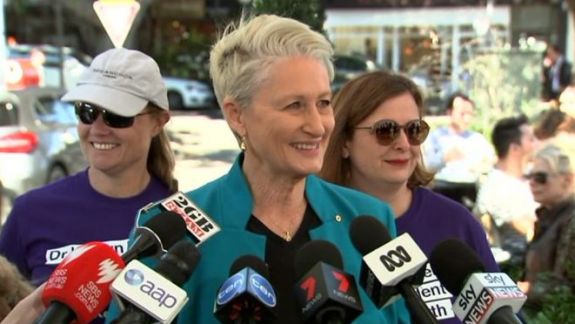 In Bondi Junction, Dr Kerryn Phelps gained 31.64 per cent of the primary vote. The LNP vote had plummeted from 56.32 per cent in 2016 to 38.5 per cent in the current by-election. Endorsement of a new style of progressive liberalism emerged as the real winner. At the boutique Vaucluse polling booth with its 527 voters, the LNP’s primary vote dipped from 96.3 per cent in 2016 to 63.4 per cent. Only 19.8 per cent of voters went with Dr Kerryn Phelps. Others perhaps thought about the prospects of cashing in on the property market before the current correction gains momentum. Gaining Dr Kerryn Phelps as the local federal MP for Vaucluse was surely a curious political miracle as life went on as usual in the leafiest exclusive lanes of Australian society. Future generations will surely look back on the Wentworth by-election as a real game changer in Australian political history. The LNP has been pushed by voters themselves to embrace a more progressive version of liberalism but its leaders simply will not take the plunge to break with 76 years of ideological successes since Robert Menzies espoused the case of The Forgotten People in 1942 (ABC News Online 22 May 2017). Dr Kerryn Phelps is one of Sydney’s ethical success stories. Her leadership is quite independent of changing political fortunes. Fortunately, she has decided to work towards democratic renewal as the political compasses of the Prime Minister’s frontbench are more firmly fixed on the old charts to future electoral successes.